As an independent, I am not trying to appeal to any particular base or ideology. I am here to represent my supporters and the priorities they set forth, while providing strong leadership on how best to solve the problems before us. This is how representative democracy should work in the 21st century. 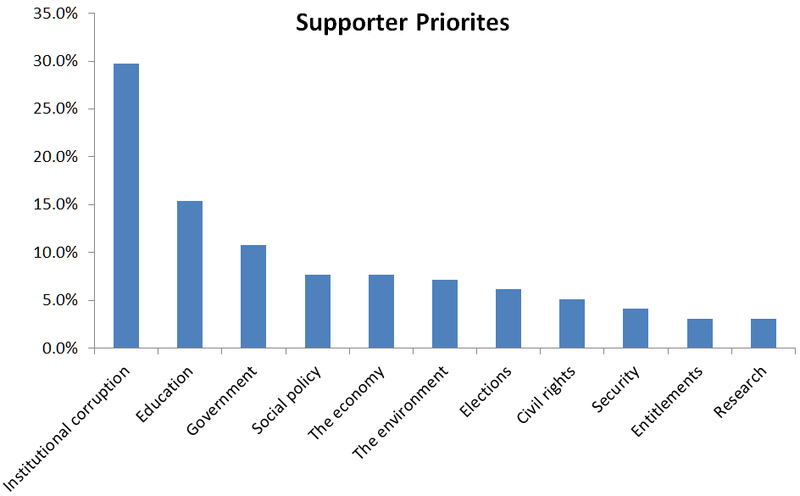 Below is the most recent report on the priorities voiced by supporters. As you can see, institutional corruption has nearly twice the importance of any other issue, yet not a single other candidate has chosen to make it his or her number one priority, much less make the commitment to running a 100% citizen funded campaign as I have. Add your voice to conversation by becoming a sponsor today. The system of corruption truly is the first issue. Before we can address any other issue, we must restore representation by removing the dependence between big money and politics. Through my campaign, I will expose the extent of this problem while showing how we do politics right. As Senator, I will fight for the legislation required to end the system of corruption and lead the charge for a constitutional amendment to ensure that it never happens again. To make America great, we need a top-notch education system that is accessible to everyone both early and late in life. This requires schools and research that push the boundaries of what we know about our world and that help people become healthy, productive citizens, with the skills needed to work on the great challenges of our time. To achieve this we need a national strategy that is aligned with both the demands of our economy and the problems that must be solved. As a scientist I know from experience that solving complex problems requires skills in math and science as well as in visual arts and communication. By rethinking the role of education we can help students find meaningful employment and lead more fulfilling lives. The complaints about government from supporters range far and wide. Some of the complaints relate more closely to other issues, but the focus for ranking this particular priority was on national debt, spending, and taxes. To have a sustainable government, we must find a way to balance spending with the strength of our economy. Debates over taxes versus spending cuts are trivial so long as the growth in spending exceeds the growth of our economy. Without fixing this imbalance, the threat of national debt overwhelming future generations is very real. The solution is not as simple as raising taxes and/or cutting spending, because they are both deeply related to our economy. Fixing this particular system requires a careful analysis of tax policy and of the economic returns on different types of spending. Our guiding principle in the analysis of taxes will be to reduce or eliminate taxes on activities that create and renew, while levying or raising taxes on activities that pollute and destroy. On spending, the analysis will focus on maximizing the return on your tax dollars, both in terms of economic and societal gains. It is time to stop holding our economy back and put Americans to work again. To have a strong economy we must first free it from the crony capitalism that has distorted our markets, allowed institutions to hand off risk to taxpayers, and let industries pass on the cost of their actions to everyone. As stewards of our planet we must have an environment that does not get pushed to the brink of collapse by an energy policy that is vulnerable to conflict, dependent upon a finite resource, and that will only get more costly and risky to extract. We can ensure a more sustainable future by taking risk seriously, by correcting the distortions in our market that do not properly account for the costs of polluting our commons, and by transitioning to renewable sources that will only get cheaper and more efficient. When it comes to food assistance, welfare, and prisons, it is clear that we need to be developing better prevention and more effective long term solutions. Changing this will require comprehensive and coordinated reforms in education, training, and economic development. It is also time for responsible drug-law reform, because the war on drugs is creating more problems worldwide than it is solving. I am a strong advocate for protecting our civil rights to love, health, safety, and privacy. As a country founded on the principle of separation of church and state, we cannot adopt policies that use the law to discriminate or force individuals to adhere to the religious values of others. We must also recognize the right to well regulated gun ownership that makes safety a priority. For too long we have let ourselves get distracted by fundamental disagreements that will never be resolved. As Senator I will shift the focus onto policies that reduce the outcomes that nobody on either side wants to see. Our digital age also demands that we provide individuals with better control over when, what, and why private information is accessed by both government and corporations. For more on my advocacy for LGBT equality see my article on the Independent Voter Network.